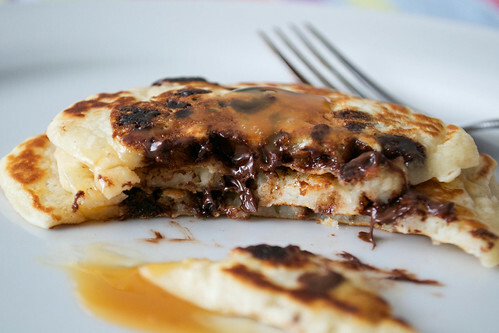 We all love pancakes - they'e cheap, quick to make and incredibly versatile. But it occurred to me, one snowy morning when I needed something a bit more indulgent than cereal, how much lovelier they would be with a sprinkling of dark (plain) chocolate chips thrown in. 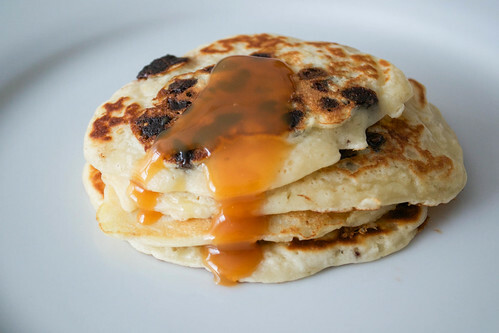 I've had these for breakfast with the girls, but they would make a great pudding too, with maybe a drizzle of toffee sauce and a scoop of good vanilla ice cream. This recipe makes quite a lot, so if you have some batter left over, either make them and refrigerate (warming up gently to serve) or refrigerate the batter and make your second batch fresh. Makes 15-17, depending on size. In a large bowl, mix together the flour, sugar, baking powder and salt. In a separate bowl or jug, mix together the milk, butter and crack in the egg. Give it a good whisk together with a fork and then pour the wet ingredients into the dry flour mixture. Mix well, but don’t overmix - and then tumble in the chocolate chips. Heat up a large frying pan on a medium heat. Trickle just a drop of vegetable oil into the pan and then tilt it so that it covers the base. With a tablespoon, drop 2 tablespoonfuls of the pancake batter into the hot pan. Cook for about 1 minute, until bubbles form and start to pop at the surface. Flip them over and cook for another minute. Serve, either as part of an indulgent breakfast or with ice cream and toffee sauce, as a pudding. How do you like to eat pancakes?